When summer hits and the temperatures rise, looking for unique ways to cool your home is an essential part of the season. However, items like regular air conditioners can cause a spike in your electricity bills, as well as harm the environment due to the emissions it creates. 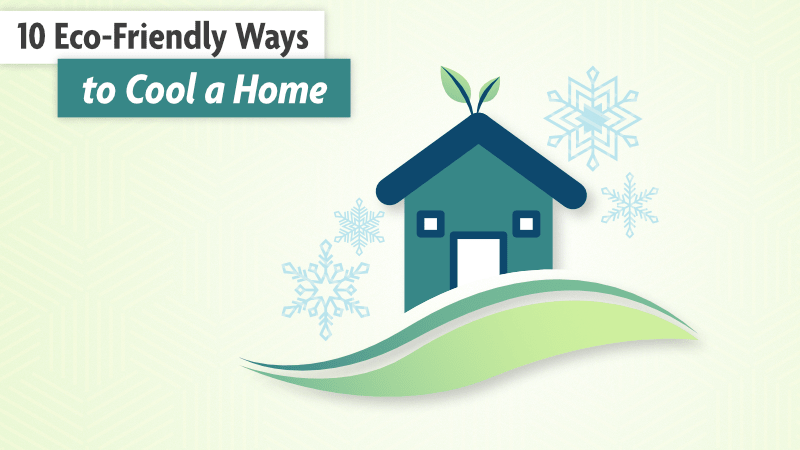 So why not look for some Eco-friendly ways to keep your home cool this year? Protecting the environment and making sure you stay comfortable can go hand-in-hand with some of these Eco-friendly ways to stay cool this year. Install ceiling fans - Believe it or not, ceiling fans can do a lot to circulate the air and make a cool and comfortable breeze with minimal energy usage compared to an air conditioning unit. When purchasing ceiling fans, you even have the option to purchase fans that are also lights, so you don't have to worry about replacing your ceiling light and also having a fan. Use reflective films on windows - If you have any windows in your home that are facing the south, applying a special UV-reflecting film coating to them can make a lot of difference. These reflect some of the sun's rays away from your window, thus helping to keep it cool inside your home. Install an Eco-Friendly thermostat - A Smart Home thermostat, such as this Ecobee 4 Smart Thermostat, can help cut down on heating and cooling costs by automating temperature control in your home. Install Insulation - Many people know that installing insulation in your home, especially your attic, can help keep it warm during the cool months. However, installing insulation can also keep your home cool in the summer, too. Choose an Eco-Friendly air conditioner - If you do want to use an air conditioner, stop using the older models that take up a lot of energy and create harmful emissions into the environment. Replace your old air conditioner with a new Eco-Friendly model. Replace your light bulbs - If you have traditional light bulbs installed in your lights at home, switch to an LED or CFL bulb. These bulbs produce only a fraction of the heat that traditional bulbs do, keeping your home cooler. There are a lot of ways to help cool down your home in the summer, from installing planters outside to switching up your thermostat. Don't sweat the heat this summer when there are plenty of ways to keep your home cooler and much more comfortable! CouponCause is the perfect place to help you find what you need to help cool your home, and also save money!